Jesus-Islam » His death » God would never allow one of his prophets to die in that way! Our Muslim friend replied, “No, no, you did not understand. 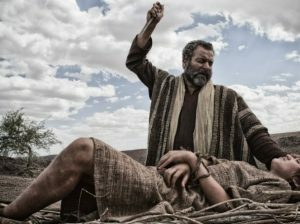 It was a different case, God was testing his faith to know if he was willing to offer his own son to God, if he was also willing to give everything to him. “Exactly,” I replied, “That’s what we’re explaining to you about God. He did not remain at a distance, indifferent to the fate of man, on the contrary, he voluntarily gave Jesus to die to save us from our sins. This was the supreme proof of his love and the most precious gift he gave to humanity. The Bible declares that “God so loved the world that he gave his only begotten Son, that whoever believes in him should not perish, but have everlasting life” (The Bible, Injil, John 3: 16). By ordering Abraham to offer him his son as a proof of his faith, God demonstrated how – in his turn – he would show his love for us in the highest degree. through the sacrifice Jesus made on the cross. We Christians know that God has given His best and done His best for us. It must be known that no one forced Jesus to be crucified, he gave himself. (Sura 2:87, see also Sura 2:91 and Sura 3: 183). In conclusion, we can see that God does and has allowed His prophets to suffer and to be killed. We have also seen that God has displayed the extent of His own love for us by sending the Messiah to die for us to save us from the penalty we deserve for our own sins.